Trailers must be collected. We are sorry, but trailers are not suitable for delivery by carrier. The only option is for them to be towed. Search for trailers by size and type from the ‘Trailers’ tab on the home page. From here you will find specific details with a picture and price. 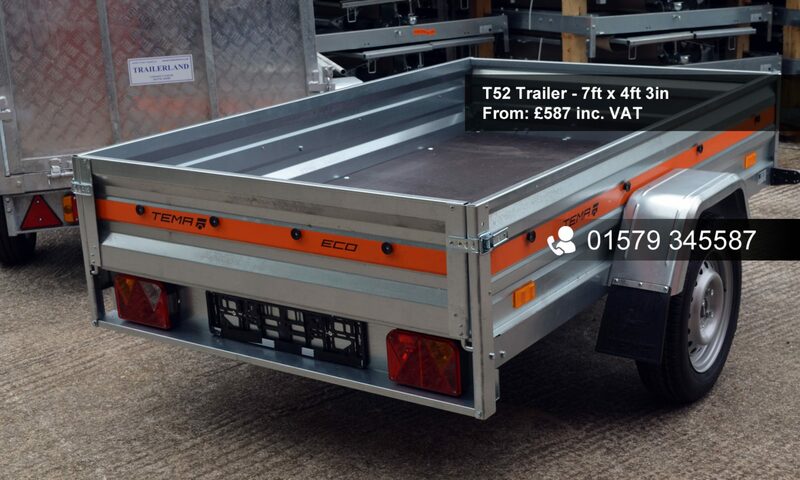 A list of trailers with sizes and price is available from the link above. We have a huge range of parts for trailers in stock but please ring first before making a special trip. Download our price list from the link above – it contains most but not all of the items we can supply. PARTS BY POST – We can supply parts by post but we are keen to make sure that you get the correct one – there are so many variations. Please ring us on 01579 345587 – we can make sure we have got what you need and then take card payment over the phone for the goods and carriage charge which is dependent on the weight and size. Please note that prices may vary – we suggest you get in touch for a current price. Please ring before making a special trip – and use directions rather than Satnav which may take you down some really narrow lanes….